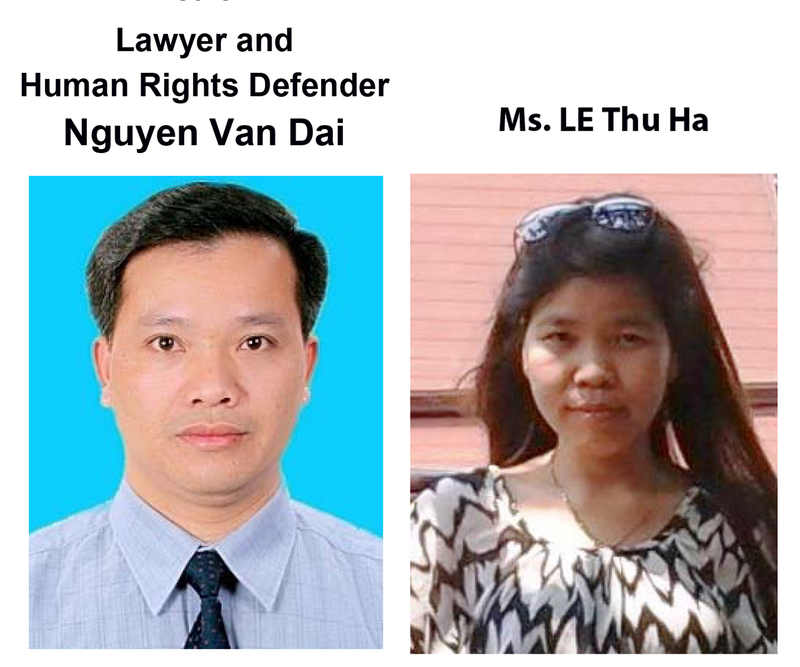 Defend the Defenders, April 16, 2017: Vietnam’s authorities have yet planned to bring prominent human rights attorney Nguyen Van Dai to court after 16 months of detention. Mr. Dai and his assistance Ms. Le Thu Ha were arrested on December 16, 2016 on charges of “conducting anti-state propaganda” under Article 88 of the country’s Penal Code. Vietnam’s authorities have extended the investigation period three times, making the pre-trial period to last 16 months in total. On April 15, Mrs. Vu Minh Khanh, the wife of Mr. Dai came to the Hanoi-based B14 detention facility of the Ministry of Public Security to supply her husband with some foodstuff. She told Defend the Defenders that she has no idea when they will bring him to court. On Aril 2, Mrs. Khanh was barred from leaving the country to Germany where she is invited to attend a ceremony and on behalf of her husband to accept Human Rights Award which the German Association of Judges (Deutscher Richterbund, or DRB), the largest professional organization of judges and public prosecutors in Germany honored Mr. Dai. Vietnam’s security forces in the Noi Bai International Airport said she cannot leave the country for political reason without giving more details. Mr. Dai, who was previously imprisoned for four years, co-founded the online group Brotherhood for Democracy in 2013 to coordinate human rights activities across Vietnam and host forums in Hanoi and Saigon to mark International Human Rights Day. Vietnam’s Communist government took Dai into custody again in December 2015 after he left his home in Hanoi to meet with EU representatives who were researching human rights issues in Vietnam. He is facing imprisonment of up to 20 years if he is convicted, according to Vietnam’s current law. Dai’s arrest came a few days after masked assailants beat him and other activists in what he said at the time was retaliation for his work educating Vietnamese people about human rights. During the past 16 months, Mr. Dai was allowed to meet with his wife only two times. He has yet to be permitted to be represented by lawyers.